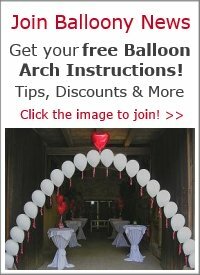 Use our tips to create unique and inexpensive wedding reception table decorations with balloons, tailored to your venue, colors and style. Balloons are, in our opinion, one of the best ways to make your wedding reception special, without breaking your budget. They come in so many colors, sizes and shapes ... there's bound to be one design that perfectly suits your style. 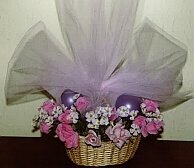 Like with anything related to your big day, planning the wedding reception table decorations well in advance is crucial. Just think how much time your guests will spend sitting at the tables, looking at the decor you have chosen. What are the colors of your flower bouquet and bridesmaid's dresses? What are the dominating colors of the venue (carpet, walls, furniture, lighting)? What's the style of the venue (modern, traditional, romantic, Asian etc.)? 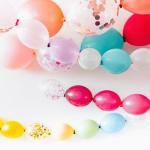 Choose balloons that match these colors and styles. For a rustic setting in a barn, for example, solid colors like red and white fit much better than pastel tones. In a modern surrounding, pearl teal and white make a good combination for your wedding reception table decorations. You haven't decided about your colors yet? Lovetoknow.com has a brilliant article to help you choose your wedding colors. How many tables are there? How big are they? What shape are they and how will they be arranged for your reception? Is it a room with high or low ceiling? If you hire a professional balloon decorator, they will check these things for you and propose the best decor to suit your venue. But if you plan to do the wedding reception table decorations yourself, you need to have an accurate picture of the whole room in your mind. 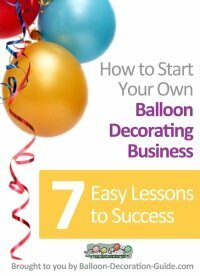 Our balloon decor checklist shows all the points you have to tick off as a DIYer. In a small room with low ceiling the centerpieces could either be balloon bouquets with a maximum of 3 or 4 balloons, or a topiary. In a large room with high ceiling the same decor would look sort of "lost". 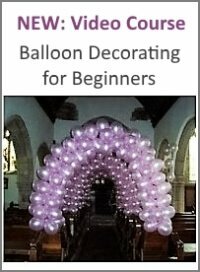 So your balloon centerpieces should have at least 5, 7 or even 10 balloons. The picture above shows a nice array of wedding centerpieces. The purple bouquet to the very right is an example for a simple staggered bouquet with three 11" latex balloons, perfect for smaller rooms. 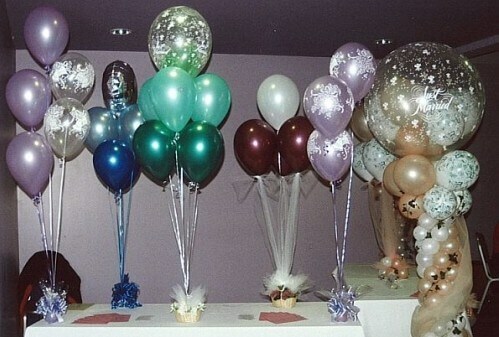 The green one in the middle has a stacked arrangement of seven balloons, with a double-stuffed clear 16" balloon on top. 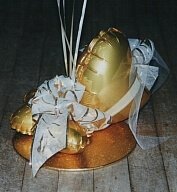 Being the anchor for your balloons, table bases are a major decorative part of your centerpiece. Personally I prefer flower arrangements for a wedding reception table decoration. Flower bases compliment the delicate beauty of balloons perfectly, especially if combined with color matching tulle. Other ideas would be a combination of small balloons, tulle and ivy, or heart shaped balloons and bows attached to a matching foam board. Alternatively, you could go with one of the many ready made balloon weights, that come in all kinds of shapes and colors (gold and silver boxes, mini champagne bottles or musical gift bags to name just a few). One of my favorites are these tin pail wedding favors in silver or pastel colors. 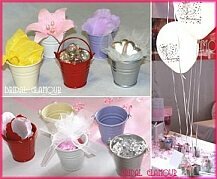 Filled with acrylic ice cubes or marbles these mini metal buckets make perfect anchors for your balloon bouquet. Fill them with candies, almonds or other treats, and you have cute little give-aways for your guests, especially for the kids. In life, it's often the little details that make a big difference. Your wedding reception table decoratons are no exception. Sprinkle silver, gold or iridescent metallic confetti on the tables. Popular shapes would be doves, hearts or bride & groom. Scatter life-like silk rose petals or contrasting acrylic ice cubes around the centerpiece. Consider using bows to decorate the head, buffet or cake table with. Or how about having hand made card name holders like our Marabou Balloon Heart? Being the focal point of the reception, you want to pay special attention to decorating the head table. Highlight it with balloon columns on either side, or with a 'String-of-Pearls' arch behind the table. Another popular choice would be a series of balloon clouds, connected with swags of tulle. Although the wedding cake itself will and should be the main attraction, you can set beautiful accents with a balloon arch surrounding the cake table, or with bride and groom figures made with balloons next to the cake. Check out our ideas now. Most pictures on this page are courtesy of Balloonaloony, Falkirk, Scotland.